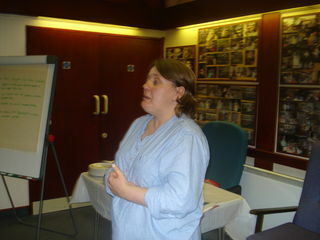 The event took place on Friday 3rd August 2012 at Coven Lodge. It was a follow up to our event in April looking at issues and problems for disabled and older tenants. It was led by Karen Ryder from One Voice (see picture) and was an opportunity for tenants to look at the key issues and concerns and to consider how tenants can make a difference. Tenants felt that they wished to be actively involved in ensuring that issues to do with disability and housing are brought to the attention of service providers, to ensure that disabled and older tenants needs are met. It certainly is a popular subject matter as the event was very well attended.